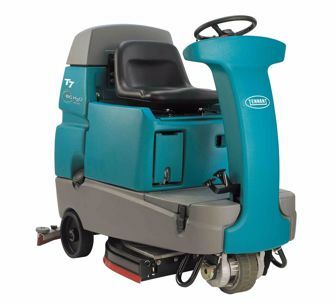 The T7 is a compact industrial grade, self-propelled, ride on scrubber, manufactured in the U.S. The combination of the T7 micro-rider scrubber compact size and front drive/steer system means you can clean floors anywhere a walk-behind scrubber can go. The T7 micro-rider scrubber can be placed on a standard passenger elevator to move between floors. T7 is available with a disk scrub deck or cylindrical scrub/sweep deck. Disk scrub deck comes in two sizes: 26 inches, and 32 inches. Cylindrical scrub/sweep deck is available in two sizes as well: 28 inches, and 32 inches. In conventional scrub mode the T7 micro-rider scrubber cleans at a rate of 23,760 square feet to 34,650 square feet an hour; depending on the cleaning path size. With fully charged batteries, the T7 micro-rider scrubber will clean for about three hours. Run time for the T7 can be increased up to 4.5 hours with the optional battery pack upgrade. Power key ignition switch, and emergency power kill switch are both standard features on the T7 dashboard. An integrated operator safety switch stops the T7 micro-rider scrubber unless the operator is seated. The T7 is corrosion resistant due to a cast aluminum drive system, cast aluminum brush deck, and cast aluminum squeegee assembly. Further corrosion resistance is enhanced by the rotationally molded polyethylene body panels, and solution/recovery tanks. Steel components on the T7 are coated with industrial grade enamel paint. One step scrub button on the T7 dashboard turns the preset scrub functions on and off. Once you have set the desired scrub functions, this is the only button you need to press. All of the functions on the T7 can be controlled independently as needed. A standard feature of the T7 is the “economy” setting for brush pressure and solution flow. When in the “economy” mode the T7 run time is increased, brush wear is decreased, and water/detergent consumption are decreased. T7 micro-rider scrubbers have low solution, and recovery tank full indicator lights on the dashboard. When either the low solution or recovery tank full lights come on, all scrub functions are automatically disabled. This system is unique to the T7 and protects the vacuum fan motor from potential damage. With Tennant’s on-board FaST detergent system, scrub time is increased three fold. Since FaST technologies reduce water consumption by 70%, floors are drier and ready for traffic immediately. The FaST detergent system is certified by National Floor Safety Institute (NFSI) to help reduce potential for slip-and-fall accidents. NSF International has further certified that the FaST detergent system meets appropriate food safety regulations. You should consider the FaST detergent system to help contribute to LEED points in your facility. Finally the FaST detergent system is a Green Seal (GS-37) certified detergent. Another popular and useful option for the T7 is the battery watering system. The battery watering system will ensure that your batteries are filled to the correct level and help lengthen battery life. The battery watering system requires no special training (simple to use) and requires no tools.